208 pages | 24 B/W Illus. 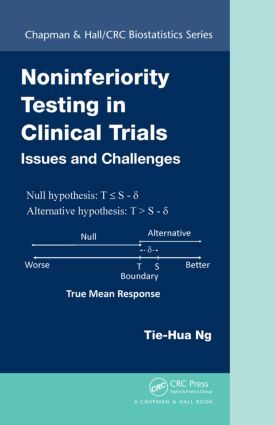 Reflecting the vast research on noninferiority (NI) designs from the past 15 years, Noninferiority Testing in Clinical Trials: Issues and Challenges explains how to choose the NI margin as a small fraction of the therapeutic effect of the active control in a clinical trial. Requiring no prior knowledge of NI testing, the book is easily accessible to both statisticians and nonstatisticians involved in drug development. With over 20 years of experience in this area, the author introduces the basic elements of the NI trials one at a time in a logical order. He discusses issues with estimating the effect size based on historical placebo control trials of the active control. The book covers fundamental concepts related to NI trials, such as assay sensitivity, constancy assumption, discounting, and preservation. It also describes patient populations, three-arm trials, and the equivalence of three or more groups. "The author gives interesting examples and discusses all issues critically with respect to existing literature. Furthermore, striking and convincing motivation is given as well as discussions at the ends of most chapters. Many diagrams and graphs clearly illustrate the respective content and statistical issues. The book allows readers from different fields to understand the concept of NI testing as well as issues and challenges related to NI testing." "This book is intended for statisticians and non-statisticians working in the area of drug development, and it is written to be easily understood by a broad audience without any prior knowledge of non-inferiority testing. It covers important aspects of non-inferiority testing, including onesided and two-sided hypotheses, equivalence/non-inferiority margins, fixed-margin and the synthesis methods, controversial issues with switching between superiority and non-inferiority testing, tests with binary, continuous and time-to-event endpoints, multiple historical studies and meta-analysis, regulatory guidances, and issues and challenges in these tests." How Do You Know the Effect Size?